For more than 70 years, Sno-Kones® has been the household name for icy treats. 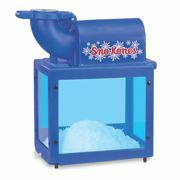 Now you can bring in cool profits of 80 percent or more with the Sno-King (#1888). This machine is built with a durable Ľ-inch thick cabinet and powerful Ľ hp motor. Plus, enjoy the convenience of a reduced weight and a handle for mobility. Simple to use and clean means this is an ideal choice for park and rec concession stands. Southern Aluminum's Swirl Tables® bring a modern yet classic appeal to any setting. These unique tables are ideal for community center events, traditional or contemporary occasions, and wedding settings and don't require linens. Created with hand-etched, randomly swirled patterns, Swirl Tables® are linenless, lightweight aluminum tables and are also ideal for outdoor events. Add a colorful coordinating spandex skirt to quickly transform any environment. Tomlinson Industries' Fusion line of countertop pizza and snack ovens are available in three designs to suit any foodservice program. Fusion ovens host an array of features including tempered glass doors, adjustable thermostat, 15- or 30-minute timer, 12-inch or 16-inch size, and ergonomic flip-up handle. Add a Tomlinson baking sheet to turn your Fusion oven into a multipurpose oven. Fusions 513FC countertop merchandiser perfectly pairs with the Fusion oven for an attention-grabbing food program. Elicit the liveliest atmosphere by employing the sweet sights and savory aromas of summertime grilling with a PORTA-GRILL® commercial barbecue grill. Designed to deliver state-of-the-art performance, super-easy portability and unsurpassed safety. Delivering up to 164,000 BTU, burners are individually controlled allowing for multiple heat zones over the 10 square feet of high production cooking area. Feed hungry crowds fast. Century Industries is The Mobile Recreation Specialist for Mobile Sound Shell Stages and TranSport Mobile Bleachers. Showmaster Mobile Stages feature effortless hydraulic actuation that's built tough. Go from ‘tow to show' in a matter of minutes. TranSport Mobile Bleachers require one person and less than 10 minutes to set up.